Last weekend I was at the Breathe Christian Writers Conference. 200 some writers, editors, agents gathered to celebrate the writing life. It was fabulous, inspiring, exhausting (in the best way possible). I could go on and on about the wonderful things that happened, the encouraging words shared. I could but I won’t. Sorry. I’ve got a novel to write. But I will share this one snippet. My friend Alison Hodgson was presenting a breakout session on writing memoir. Her first book The Pug List releases in the spring and I’ve been itching to hear her speak about the experience of writing about Oliver. Yeah, he’s a dog. Yeah, he has his own Instagram account (which I love). Yup, I’ll wait while you go follow him. To be honest with you, she lost me after that. Why? Because that simple prayer, that gentle inspiration knocked me right off my feet. How can my writing serve? Of the billion or so sentences I heard at the conference those two were the ones that seeped into me. How can my writing serve? It’s a prayer. Then I started to think about other areas in my life. I’m not just a writer, you know. I’m a wife. How can my wife-ing serve? I’m a mom. How can my mothering serve? A friend, a neighbor, a cook and housekeeper (a bad one) a sister and daughter. I have this life. This opportunity to live in such a way that takes care of others. In a way that feeds into their lives. How can my life serve? I really wish I could have filmed how she said it. Alison is one of the most sincere people I know. Whenever I think about her saying that I get choked up. Such a way to live. As a sister, you serve as a constant source of encouragement and laughter… and since the “joy of the LORD is our strength,” that makes you a piece of Jesus in my life! This is stinking awesome, Susie. Thanks. Hits home, is quotable, is print-off-able. Need it, and I’m grateful! Love this SO much. 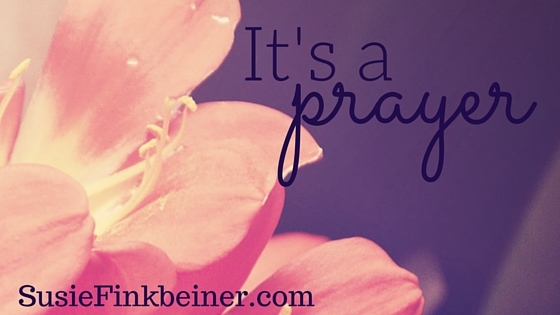 “It’s a prayer” has become a constant in my life. Now to live my life as a prayer! Thank you for this post, Susie. Came at a great time. And I think truly you’re writing IS a prayer – so much faith in them. Thank you, Beth! And I am praying for you!